Kids canopy beds make little girls feel more like princesses almost more than anything. In their favorite movies they always see the beautiful princesses with the tall spindled beds in their elegant bedrooms living a life of happiness. Having a bed like the princesses in the movies would make any girl feel special. These types of beds originated in castles and other large estates for people who desired to live in luxury. During the winter a thick curtain was draped around the bed to maintain warmth in the big drafty castles. In the summer small netting was draped around the canopy to ward of mosquitos and other insects that might attack during the night. Air- conditioning was not in existence yet and windows had to be left open during the hot summer months. We've all heard the term "dress for success" but maybe you have never heard the term "sleep for success". Our surrounding make a sub-conscious difference on how we feel about ourselves. Imagine how good your little girl would feel waking up on a lazy Saturday morning when the first site she sees is her beautiful canopy bed. With the sunlight gently beaming through the windows and the smell of breakfast coming from the kitchen a feeling of importance and elegance is bound to be what you little girl wakes up too. Canopy curtains set the color and design theme for the bedroom and can be instrumental in making the decor perfect. Some are included in bedding sets while others can be purchased separately. Many times the only type of beds with canopies that will work for kids is a twin size. They are small enough to fit into the room nicely and are an extremely cute piece of bedroom furniture. Most of the time they are finished in white so that they fit into the decor of a girl's bedroom nicely. Some have solid wood construction while others are made out of wrought iron moldings. White is a beautiful color choice for any kids room it sets the theme for purity and light which is how I'm sure all parents look upon their little princesses. Wooden canopy beds for kids is a rare find but can make a great fit into a kids bedroom. They come in traditional Victorian or rugged log style construction. A metal constructed canopy can come in Victorian or four poster style and can be decorated with a small curtain up top or be covered with floor length mosquito netting drapes. A black metal designing can bring sophistication to a kid's bedroom and give them the feeling of being all grown-up. A full or twin size is a great choice for a teenager. Wrought iron canopy beds are full of elegance and style and can make a great addition to any kids bedroom. Constructed of iron they are sturdy and will provide lasting beauty for years to come. The log canopy bed sets the cabin motif by making a strong statement of beauty and strength. Most of the time they are constructed out of solid cedar logs for strength and beauty. 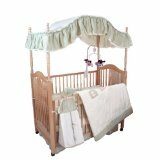 A baby bed canopy is an adorable piece of bedroom furniture that can turn any nursery into and elegant baby room. They can be found in Corsican iron or traditional wood. A doll canopy bed is a precious little toy that gives little girls a great place to give their baby dolls a nap and makes a great addition to their toy collection.